Archbishop Rajan of India has issued in 27 June 2017, the Mandate for the consecration of Bishop-elect The Rev Dr A Augustine CJ B.Th M.A. D.D, to be the bishop for Chengalpet-Kanchiruram Diocese. The service will be held at Ephatha Evangelical Anglican Church on the 28 August 2017. ​On 10 June 2017, The Most Rev. Stuart Lawson, Metropolitan Archbishop for the AECI, was awarded a Doctor of Divinity by Newburgh Theological Seminary. He was formally presented with it at the service held at St Luke's,Sale, Victoria, (where he acts as Episcopal Vicar) by Parish Council member, Dr Arthur Dell, on 16 July 2017. On 26 June 2017, the consecration as bishop for The Rev.d Canon D Emanuvel CJ B.Th M.Div, as the bishop for Arakonam Diocese was held at Ephatha Evangelical Anglican Church, predide over by the Most Reverend Rajan Babu. In early May 2017, Metropolitan Archbishop The Most Rev. Stuart Lawson was able to welcome the Rev. David McNally and his congregation, based at Kilwinning, Strathclyde, Scotland, into the AECI, and the church extends its best wishes and prayers to the new parish. During May 2017, Bishop Augustine of the Province of Malawi has been able to announce that approval has been given for the operation of a school to be run by the church in Malawi. It will provide schooling for many of the children in the district who would not normally be able to access schooling. As well as this, a maize mill has been obtained which will be able to be used by the community and will generate funds to assist in the churches' development work in the country. ​Archbishop Rajan of India has issued in May 2017, the Mandate for the consecration of Bishop-elect The Rev.d Canon D Emanuvel CJ B.Th M.Div, to be the bishop for Arakonam Diocese. The service will be held at Ephatha Evangelical Anglican Church on the 26 June 2017. ​As part of this Consecration , Metropolitan Archbishop The Most Reverend Stuart Lawson, has approved the erection of the new Diocese of Arakonam in the Province of India. On 8 January 2017 a Covenant of Intercommunion was agreed to by The Most Reverend Stuart Lawson, Metropolitan-AECI, and Archbishop Peter McInnes, Primate Archbishop of the Anglican Independent Communion Australia. On 21 September 2016 The Right Reverend Francis Jegan was consecrated bishop for our Diocese of Telengana. The Most Reverend Rajan Babu was the principal consecrator, assisted by The Right Reverend Francis Jegan and The Right Reverend Manuvel. This took place at the YMCA, Secondrabad, Telengana State, South India. On 21 September 2016 The Most Reverend Rajan Babu was installed as archbishop and assumed responsibility for the new Province of India which was previously part of the Province of Australia, Oceania and India, and is now formally erected as a separate Province. This took place at the YMCA, Secondrabad, Telengana State, South India and was presided over by The Right Reverend Ambrose , Bishop of Chengalapet. On 10 September 2016 The Most Rev'd Travis Crocker was consecrated bishop and appointed archbishop to act as the Vicar-General for the Province of the USA. This took place at Celtic Rite Old Catholic Church in Imperial, Missouri at the request of the Provincial Archbishop and supported In Absentia by the Metropolitan Archbishop, The Most Rev'd Dr Stuart Lawson.. Following on from this the Most Rev'd Ken Denski was appointed Provincial Chancellor. ​From 28 July 2016, the Most Rev'd James Alton Groover has been appointed as the Provincial Archbishop for the re-established province in the USA. In June 2016 The Province of Malawi was formally approved to take part in the Prison Ministry within Malawi. In June 2016. The CECI sought to be fully part of AECI and relinquished its independent status to become a new diocese, known as the Diocese of Erode. The Right Reverend Manuel Joseph was incardinated as the bishop for the new diocese. has approved the erection of a fourth Diocese in The Province of India, to be known as the Diocese of Andhra. has approved the erection of a third Diocese in The Province of India, to be known as the Diocese of Telengana. Rev'd Fr. Francis Jegan has been selected to act as Archdeacon for the diocese​ until a bishop is selected. There are about 38 other priests to be brought under this diocese. into Affiliation and Full Communion with AECI. We welcome Revd. Babu Daniel (Synod President), his clergy and people. on the 26 December 2015 at which five were ordained priests and seven as deacons for the church in Malawi. replacing Metropolitan Archbishop John Langley on his retirement due to ill health. Archbishop John will retain the title of Emeritus Archbishop. on the 29 August 2015 when five men were ordained deacons for the church in Malawi. and appointed as Bishop of the new Diocese of Chengalpet in the Province of India. at St. Francis Church, Mangochi, Malawi. by Archbishop Emeritus Norman on 3 May 2015 until Archbishop Metropolitan John Langley can resume his office. The Rev'd. Fr. Augustine Phondo CJ. the Vicar General for The Anglican Episcopal Church International - Malawi. The Asia Pacific Evangelical Center in Malaysia is in Affiliation and Full Communion with AECI-India. We welcome Rev. Fr. Edward G Subramanian who has been Incardinated and Licensed as a Priest in AECI-India and who has also been admitted to The Order of The Companions of Jesus. The Episcopal Anglican Church of South India (EACSI) has been welcomed into Affiliation and Full Communion with AECI-India.We welcome Bishop N. Stephen, his clergy and people. The Rt. Rev'd. Dr. N Stephen has been admitted into The Order of The Companions of Jesus. Missionary Province in Colombia, South America. the Presiding Bishop of The Missionary province of Colombia. Bishop Fandino and his clergy were recently Incardinated into AECI. Priestly Order of the Companions of Jesus. In the Name of the Father, the Son and the Holy Ghost. Amen. The Anglican Episcopal Church International – India. Metropolitan Archbishop The Most Rev’d. Dr. John Langley CJ. Most Rev’d. Dr. T. Spurgeon. Metropolitan of The Anglican Episcopal Church of India. Most Rev’d. Dr. Paul Raj. Metropolitan of Bethel Anglican Episcopal Church of India. Kadur, Karnataka State, South India. on the Fifteenth day of August in the Blessed year of our Lord 2015. Holy Catholic Church, Anglican Rite, Province of Coastal Atlantic and South America. to the Episcopal Order of Bishop. Dutch Reformed Church, City Centre, Harare, Zimbabwe. The Anglican Episcopal Church International on 18th June 2014. Order of the Companions of Jesus. to the Office of Primate I, Provincial Archbishop, Province of the United States, AECI. The service was held at 3:00 pm on May 14 in the Chapel of St. Luke, Moyock, NC, USA utilizing the service provided by the AECI - Worldwide and in accordance with the AECI canons and BCP. 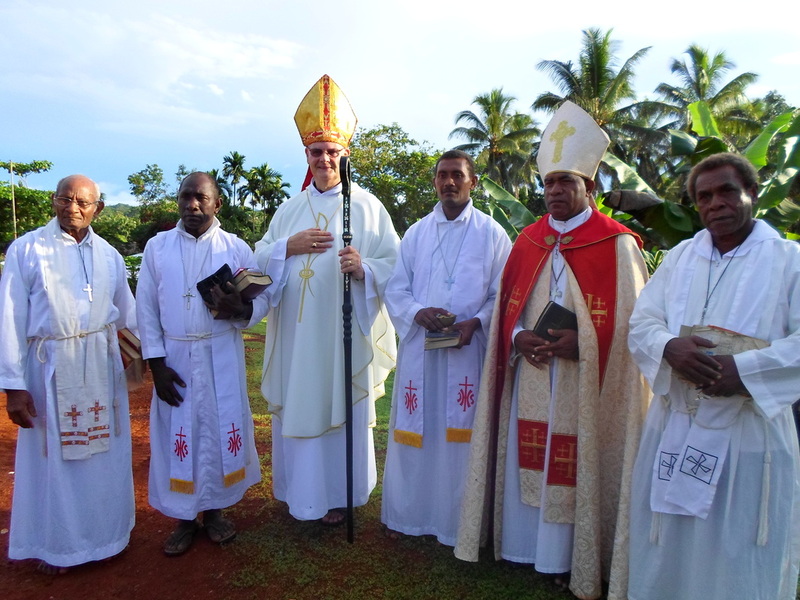 Archbishop’s Visitation to the Episcopal Church of the Solomon Islands 24th – 29th April 2014. A well planned Programme and Itinerary had been arranged and delivered for the Archiepiscopal Visitation to the Episcopal Church of the Solomon Islands by Metropolitan Archbishop John Langley. Shortly after arriving at Honiara, the Archbishop was very pleased to celebrate the Holy Eucharist at Holy Trinity Church at Mount Kopal. After the Service, the Archbishop was treated to lively singing, dancing entertainment and feasting provided by the parishioners. The following morning he was able to meet with Bishop Lonsdale and discuss relevant Church topics etc. In the late afternoon Archbishop John, Bishop Lonsdale and a delegation from ECOSI left Honiara by boat for Isabel Island. At Kolotubi, the Archbishop was greeted by the Marching Band and Singers and Flower Girls who led him to the Community Meeting Place. The Priests, Chiefs, Elders, Mother’s Union, Parishioners and children greeted him. They also welcomed him in speech and song. At Evensong in the late afternoon, in the Church of Christ the King, the Archbishop administered Confirmation to 23 children. This was followed by a programme of feasting and entertainment. The next morning, Archbishop John celebrated the Holy Eucharist, preached and administered Holy Communion to the newly Confirmed children receiving their First Holy Communion. It was a very moving Service. A programme of feasting and activities followed the Service. Archbishop John presented a Bible to Fr. Gabrial parish priest of Kolotubi and a donation from St Luke’s, Sale Australia to Bishop Lonsdale. Farewell speeches were made. The parishioners sang ‘God be with you till we meet again’ to the Archbishop before he gave his final blessing. The Metropolitan Archbishop was uplifted and humbled by his Visitation. The love, fellowship and friendship of The Episcopal Church of the Solomon Islands were sincerely expressed to the Archbishop. He was so grateful to Bishop Lonsdale, Priests, Chiefs, elders and Parishioners and to all for the care, planning, help, rehearsing and cooking etc which was so lovingly prepared for his Visit. on the Twenty-first day of June in the Blessed year of our Lord 2014.
and in the 7th year of our Consecration. and was presented with Certificate, Bible and gold cross lapel pin. We welcome them into fellowship and service. The Episcopal Anglican Church in Zimbabwe. the Priests, Deacons and Congregations. The Rev'd. Rajan Babu CJ. The Anglican Episcopal Church International. It is with great sadness that we announce that The Venerable Archdeacon David Crofts passed away just before last Christmas following a hard fought battle with Cancer. We offer our heartfelt sympathy to his wife and family. David also acted as the Director of Ordinands for the Arch-diocese. He will be sadly missed by all who knew him both inside the Church and his many other interests. We welcome the Staff and Students into fellowship. The Anglican Episcopal Church (India). together with their Priests and Congregations. to be installed as Metropolitan of AICW. and pray God's blessings on his new appointment. The Anglican Independent Communion - Worldwide Province of Chile. together with his Churches, Clergy and People. Metropolitan Archbishop Emeritus of the Anglican Independent Communion -Worldwide. 'New parish installs bishop, archbishop. Nearly 100 people celebrated with the Parish of St Luke in Sale on Sunday, as Archbishop John Langley of the Anglican Episcopal Church International, consecrated the Reverend Stuart Lawson as bishop. Archbishop Langley had travelled from Perth with his wife Patricia, and other friends and family of Bishop Lawson travelled from across Gippsland, as well as from Melbourne, Adelaide, Sydney and other parts of New South Wales. The Seventh Day Adventist Church minister and members had made the use of their hall available for the service and Bishop Lawson acknowledged the spirit in which such co-operation was made. He said the aim of his church was to establish other churches and welcomed contact from anyone who might wish to help establish new Anglican-style parishes. The AECI has no paid ministry and meets together in homes or rented premises. Archbishop Langley spoke during the service on the difficulties facing people in many Christian denominations in keeping true to the Bible and keeping at bay those ideas that would undermine the Christian heritage. Towards the end of the service, Bishop Lawson, as his first act as bishop, installed Archbishop Langley as the Metropolitan Archbishop of the church, and he will take up the mantle of responsibility for the church worldwide when he returns to Perth. The Rev'd. Richard C Weber, Missionary Outreach in Canada has been appointed Honorary Canon. Personal Lay Chaplain to the Metropolitan Archbishop. to serve in the Diocese in the State of Para (North). Archbishop Primate of Brazil, The Most Rev’d. Dr. Rui CostaBarbosa. on the Fifteenth day of July in the Blessed year of our Lord 2012.
has been granted to all the Archbishops of AECI. To all the faithful in Christ Jesus throughout the world. Holy Scriptures, and soundness in the Faith we have been well assured. on the 15th day of July in the Blessed year of our Lord 2012.
being duly authorized by me to carry out the said Installation on our behalf. this 4th day of May 2012 in the 14th year of our Consecration. We are grateful and thankful to our Founder for all his vision and guidance of AECI. We wish him well in taking up less onerous duties in AECI. Co-Adjutor, Archbishop John Langley, will take over Metropolitan leadership of AECI. He will be installed as Metropolitan Archbishop of AECI later this year. The Province of the United Kingdom and Europe. My dear brother in Christ Jesus, ++ Victor Manuel,Greetings in the wonderful Name of our Lordon this Joyful 25th Anniversary of your Ordination. May I add my own personal greetings to the many that you must have already received on this very special anniversary of your Ordination to the Priesthood. Since that momentous date you have accomplished much, with the Lord's help, in your endeavors to extend the kingdom of God in the corner of his vineyard that has been placed within the boundaries of your Provincial oversight. I pray that the Lord will grant you many more fruitful years to serve Him, who alone is worthy of our praise and worship.You are constantly in my prayers, my true friend and brother, ++ Victor. to serve in the Diocese of Victoria, Australia. and in the 5th year of our Consecration. Bishop +Edward Robinson de Barros Cavalcanti, Diocese of Brazil. who were murdered together on Sunday evening the 26th February 2012.
but also in the whole of Latin America and on the world stage. His passing will be felt not only by those who were privileged to know him personally, but by all who strive to maintain the true nature and calling of the Anglican Church. Ordinary of the Diocese of PARA for The Traditional Anglican Church of Brazil. Bishop +Mota was promoted to Glory on January 1st 2012. We extend our heartfelt sympathy and condolences to his family and friends. Missionary Outreach for The Anglican Episcopal Church International. Rev'd Fr Richard C Weber CJ was received as a member and Incardinated as Priest. Archbishop and Metropolitan of their respective Churches. The Characteristics of Catholicity, Autonomy and the Autocephalous state of either Church. of the RC Archdiocese of Medellin, Colombia, South America. to the Continuing Anglican Church in South America. as a member of 'The Archbishop's Advisory Council'. has made the following ecclesiastical appointments. for the whole of Africa. for the whole of Continental Europe. for the whole of Latin America. Most Rev'd Norman S Dutton and Most Rev'd Victor Manuel Cruz-Blanco. Bishop Peter Compton Caputo who in turn was Consecrator of Norman S Dutton. This maintains an historic link in our Apostolic Succession. Metropolitan Archbishop Norman S Dutton has established an Advisory Council to deal with such matters as Inter Church Communion and formal Concordats, with like Faith Groups and Denominations, and also to act as a Liturgical Commission for the Church. Archbishop ++ John Langley as Co-adjutor Archbishop & Metropolitan Chancellor. Archbishop - Primate of the Province of Australia, India & Oceania. Archbishop ++ Clive Read Archbishop - Primate of the Province of Europe, and Secretary Trustee of The Anglican Episcopal Church International Ltd.
Archbishop ++ Solomon Okoro Archbishop - Primate of the Province of Africa. Archbishop ++ John Gains Former Archbishop - Primate of the Province of the Americas for The Anglican Independent Communion, & Bishop of The Independent Anglican Church (Canada Synod). -The Anglican Episcopal Churches of India have requested that the Most Revd Dr John Langley be their Primate. He will now have Archiepiscopal oversight of the Province of Australia, Oceania and India. Applications have been received from various Churches wishing to be Affiliated with the Anglican Episcopal Church International. The Metropolitan Archbishop ++Norman S Dutton considered the requests and warmly welcomed those churches into affiliation and in full communion with AECI. The Ven Dr David R Hallam was consecrated to the Episcopal order. He is appointed as the Bishop of The Northern Counties of England. On 2nd April 2011 The Anglican Church International joined The Fellowship of Confessing Anglicans. was Consecrated to the Episcopal Order on Saturday 2nd April 2011. 'The Consecration on the 2nd April 2011 was held at the St. Michael and All Angels Parish, Bungoma, Kenya. In attendance were our priests, bishops and pastors from other churches in Bungoma, friends and relatives. Conducted by Bishops, Emmanuel Mayeku and Peter James Onguko these are outstanding servants of God with an upright moral standards of living. the Most Rev'd Dr Solomon Okoro as Primate of AECI Province of Africa. in the Province of Australia, India and Solomon Islands.